[FTC Disclaimer] Certified Angus Beef is one of my sponsors and I receive compensation from them. It's easy being a brand ambassador for a product that I already use and love. St Patty's Day is upon us and one of the most popular menu items is corned beef. Making corned beef from scratch is a several day process so it's too late to do it this year but don't worry. Certified Angus Beef has a short cut method for Irish Braised Corn Beef that you can still pull off in time for dinner tomorrow. Chef Michael Ollier also did a great Facebook Live video about corned beef last week as well. But for me, I only make corned beef so that I can smoke it to make pastrami! 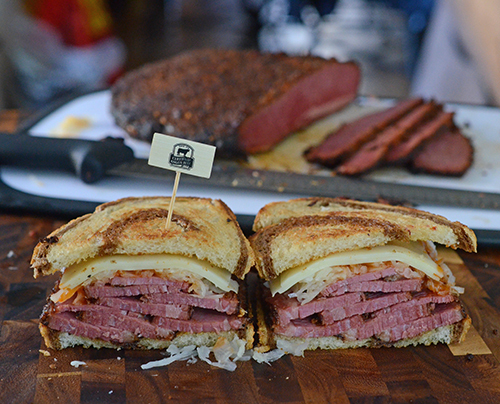 The Reuben sandwich is one of Alexis' all-time favorite sandwiches and it's even better when you make the pastrami from scratch. 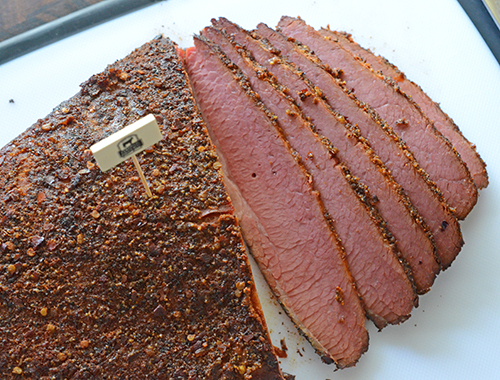 Start with a quality beef brisket "flat" from Certified Angus Beef. 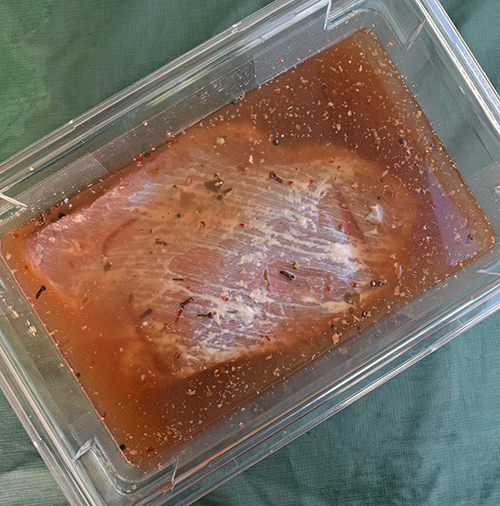 Make a heavily seasoned brine with savory flavors and pickling spices. Use the brine to wet cure the flat for several days. 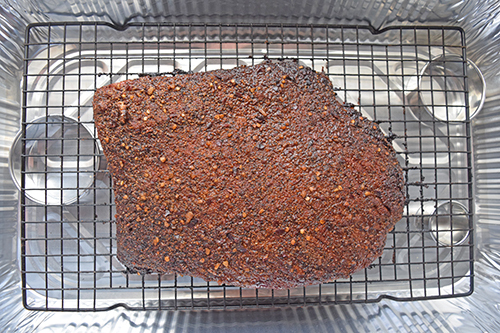 Rinse off the brisket flat, dry it, and season with a black pepper and coriander based seasoning. 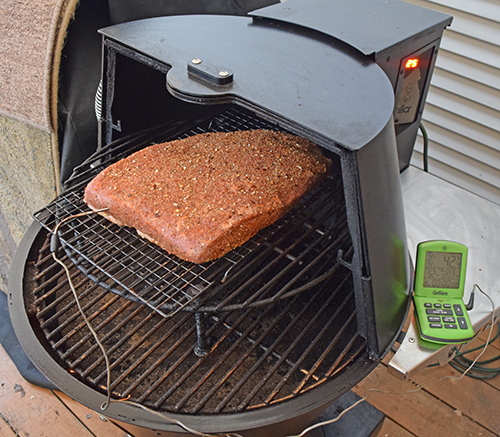 Smoke the brisket to 165°f-180°f. Steam the brisket to 200°f. Montreal Smoked Mean from Andy Husband and Chris Hart's book, Pitmaster. I could just buy a brisket flat and start there, but I had a few whole briskets in the freezer and used that instead. So I separated the flat (pictured left) from the point (in my hands) and trimmed off most of the fat. 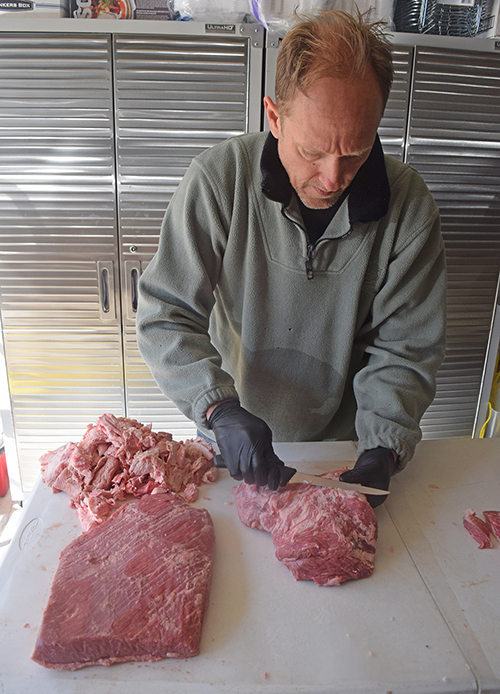 The fat pile was used to make beef tallow so it's not waste. Trimmed and ready to use. I used the point on the right to make burnt ends to satisfy my beef cravings while the flat cured for a few days. 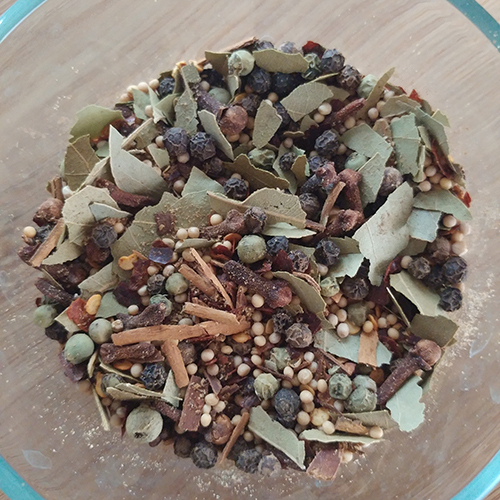 Pickling spices - You can buy pickling spices but I prefer to make my own. I did a variation of Michael Symon's. It makes a good bit (about 1/4 cup) and you only need a couple of tablespoons but you can use this mix for general pickling. 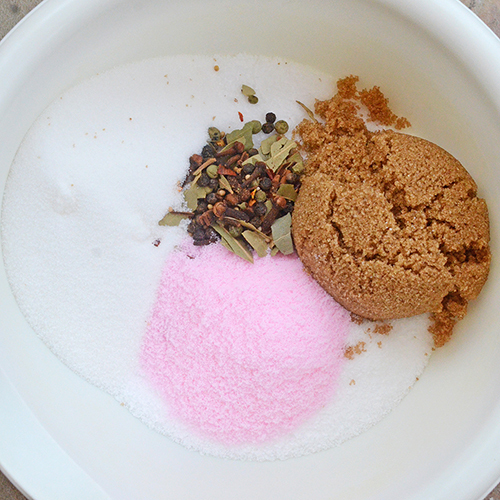 Mix all ingredients together and keep in an airtight container for up to 6 months. The wet cure is a lot of kosher salt, pink curing salt, white sugar, brown sugar, honey, and a gallon of distilled water. I never use tap water for brines and cures. If the meat is going to sit in the water for a long time, chlorinated, fluoridated, and who-knows-what-ated municipal water will affect the taste. For food safety, you have to make sure that the brine mix has been cooled to 40°f. Basically plan on cooling it overnight in the fridge. 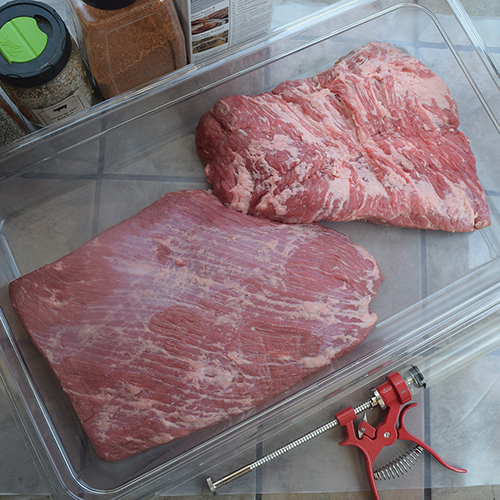 You also want to make sure that the container that you use is non-reactive and sized appropriately so that the volume of the brine covers the brisket flat. 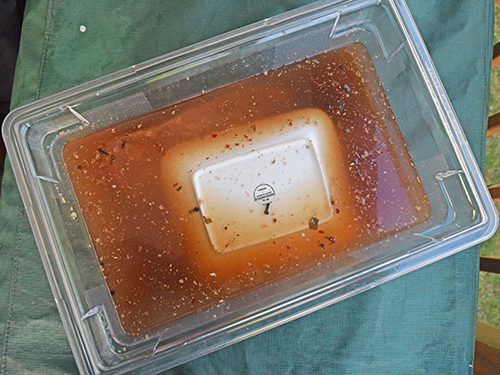 The one I used is a 2-gallon commercial food tote and lid which fits in most home fridges. After a 3 day brine, rinse it to get the exterior brine off. Some folks like to soak their corned beef in plain water for a few hours to knock down some of the salt but I like just the rinse. Dry it off well and apply a binder like 1-2 tablespoons of olive oil or mustard. 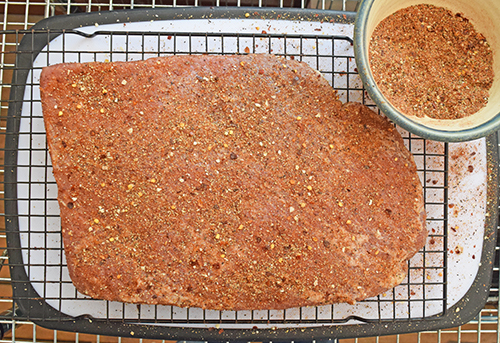 Then season the flat very heavily with a black pepper and coriander based dry rub. You can just use black pepper and crushed coriander seeds but I used a variation of the rub from the Montreal Smoked Meat in Pitmaster. 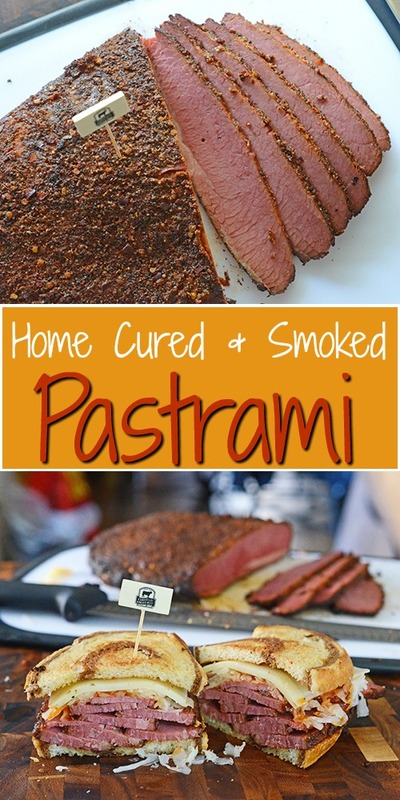 I smoked my pastrami on a pellet cooker but the process is the same for a kamado, drum smoker, or kettle grill. Smoke it around 275°f until it hits 180°f internally, which took just under 6 hours for mine. There's nothing special about the rack it's on, I just used it to make it convenient to move the brisket to and from the grill. Once it is done, let it cool for an hour and then refrigerate it overnight. Note: You could just smoke the brisket until it's done at 200°f and be done with it but I like to steam the pastrami to finish it. That is what the renowned NYC delis like Katz do. To steam finish the pastrami, carefully put 1" of boiling water in a large foil pan. Place the pastrami on a rack ABOVE the water. I used a few circle cutters as stands but you can use rolled up balls of foil. Tightly seal the top with foil and place this in a 300°f oven until the meat hits an internal temperature of 200°f. That took almost exactly 90 minutes for mine. 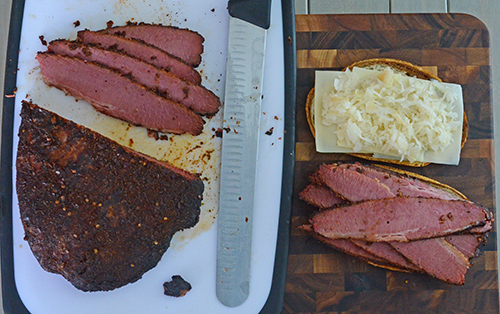 Wait 30 minutes and then you are free to slice your pastrami across the grain. You can use a meat slicer but I just freehand it using a 10" carving/slicing knife. The sharper the better, so you don't mess up that beautiful, spicy crust. This was fresh sliced but if I was using leftover pastrami, I'd top the meat side with cheese and pop it under a broiler until the meat is heated through and the cheese bubbly and staring to turn golden brown. 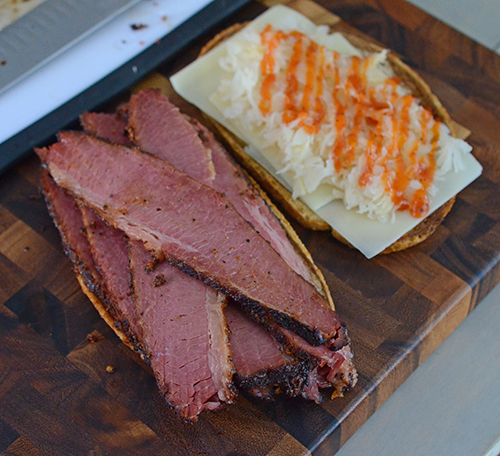 Don't be bashful, pile that pastrami high! The ones at a deli often look even taller than this. My favorite use for leftover pastrami other than sandwiches this. Chop it up into 1" chunks and use it in a breakfast hash of cubed potatoes, onions, and bell peppers seasoned with pepper, salt, and chili powder. Top that with a poached egg and enjoy!